The iPad went on sale 25 days ago. It’s not yet on sale anywhere else in the world besides the U.S. The 3G version, which some are waiting for, still isn’t available. And yet, according to our logs, the iPad already accounts for more traffic to TechCrunch than Android does. Now, it’s perfectly possible that the iPad numbers are padded a bit simply because a ton of people just got the device and are trying it out for the first time and TechCrunch is a logical first stop (we hope). But 0.99% is actually the highest Android has ever been — up 0.11 from its previous record last month. The fact that the U.S.-only iPad contributed more traffic to TechCrunch in its first 25 days than Android (a platform which is 18 months old and available around the world) ever has in any month is impressive anyway you slice it. 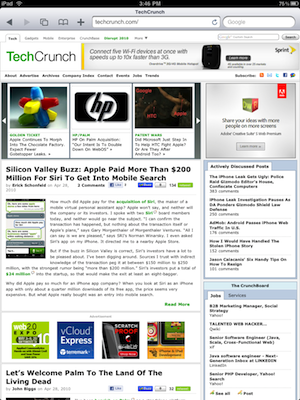 The other number that stands out here is just how many TechCrunch readers use the iPhone to read the site. At 5%, it blows away Android. This is somewhat surprising given the report by AdMob yesterday that Android has passed iPhone web traffic in the U.S. Though, the validity of those numbers has been disputed. It’s also not exactly clear what “iPod” is. The logical guess is the iPod touch, but that runs iPhone OS, so wouldn’t it just be listed under “iPhone” as well? On the flip-side, the iPad also runs iPhone OS (though a different flavor (3.2) right now than any other iPhone OS device), yet it has its own category. So let’s assume “iPod” is the iPod touch. That means that all the iPhone OS devices put together account for 6.85% of all TechCrunch readership in the past 30 days. That’s more than Linux, Android, BlackBerry, and Symbian combined.